Is Shorten the new Abbott? When Bill Shorten went into attack mode on Malcolm Turnbull on Monday, before Abbott had even accepted Turnbull's challenge, Michael Galvin says the Opposition leader may have made a fatal miscalculation. If Bill Shorten loses the next election badly and flames out as a political figure worth reckoning with, he might do well to pause and consider the role that his words about Malcolm Turnbull on Monday (and again on Tuesday) played in his own eventual downfall. As Tony Abbott was being led to the waiting guillotine, Shorten launched a vitriolic attack on Turnbull, essentially accusing him of being another Abbott in different clothing. Abbott, Turnbull, they are all the same, was the gist of Shorten’s unhinged rhetoric. I wonder if Shorten has yet realised the appalling stupidity of those words, at that time and in that context? For a start, he showed the same tin ear towards the Australian electorate that Abbott showed so often. And he revealed more about himself than he could possibly be happy about in retrospect. Mr Shorten, don’t you get it? Dozens of polls in the last two years have shown that huge numbers of Australians do not believe this nonsense that Abbott and Turnbull are interchangeable villains. They distinguish between the two — in favour of Turnbull. However much you might find the idea unpalatable, many Australians vote for their leaders on the basis of ideology and character, not ideology (or character) alone. Shorten seems to have been completely oblivious to the feelings many Australians have had about Abbott and what they have been feeling for the past 36 hours. Simply put, Abbott was a dangerous nutter, clearly not up to the job. Turnbull is obviously not a nutter. He speaks sense rather than nonsense. (Whether you accept his sense is another matter.) And he has yet to be tested as PM, so we have no idea yet what kind of Prime Minister he will be. Therefore he cannot be condemned as a failed PM — yet. Unlike the downfall of Rudd, there was no shock at Abbott’s downfall. People were either relieved, or happy, or just accepting of the fact that an incompetent leader had been relieved of his command. These feelings about Abbott ran very deep and wide in the Australian electorate. Why didn’t Shorten try to articulate some of the relief that was being felt around the nation? A tyrant had been brought down. Why didn’t he try and engage with this brief moment of goodwill towards Turnbull — short-lived though it might be, rather than just pretend it wasn’t happening? Perhaps the answer lies in the terrifying possibility that Shorten is more like Abbott than previously thought? That what was bad for Abbott was good for him and that this led to a strange identification, and an inability to acknowledge Abbott’s legion of flaws? (Shorten and Abbott, after all, are both Jesuit boys.) Maybe Shorten does not see Abbott as contemptible as many of us do, and in fact sees him as “one of us”? An alarming thought. Also, by going into “attack dog” mode, just as Abbott was about to be put down, and Turnbull was giving speeches full of hope and optimism for the Australian future, Shorten was turning himself into … another Abbott! Consumed with negativity and ill-will. 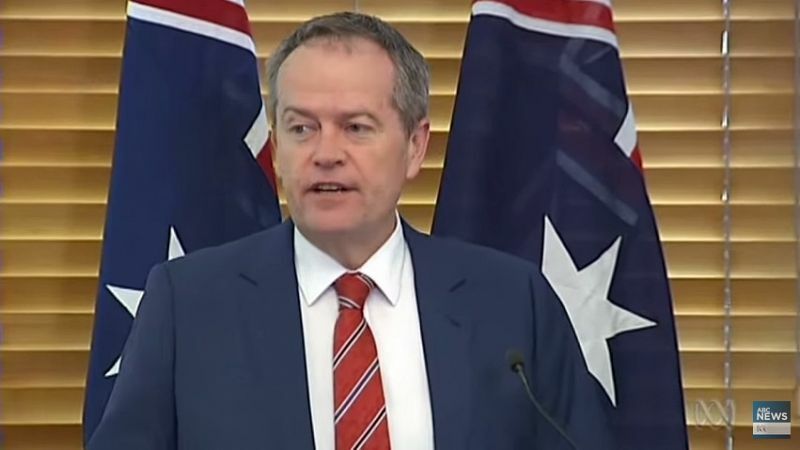 As a Labor voter all my life, I hope Shorten’s Monday outburst was an unfortunate aberration. It will do nothing to win over the moderate middle that is necessary for a progressive victory and it reminds everyone that Shorten is a politician’s politician — and is maybe not much more substantial than that. A new day. Subscribe to IA for just $5.